Do you have a picky eater in your household? See if this recipe is a hit with them? -HEAT oven to 350ºF. Top chicken with ham and cheese; roll up. Secure with toothpicks. 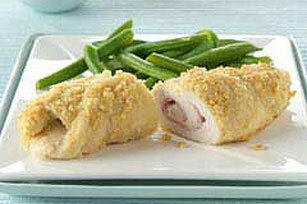 -DIP in eggs, then in cracker crumbs, turning to evenly coat all sides of each roll-up. Place in greased 13x9-inch baking dish; drizzle with margarine. -BAKE 40 min. or until chicken is done (165ºF). Remove and discard toothpicks before serving. While the chicken is baking, cook brown rice and peas to serve with this flavorful entree. Use food processor or blender to crush the crackers.